Tile by Style specializes in residential tile installation in Calgary. Each home presents unique challenges and offers an opportunity to create a new style. That's what keeps our installers motivated and on top of the latest trends in design and in the technology that makes tile a more durable and sustainable building material. Residential tile offers opportunity for creativity and style. Glass tile is featured throughout the kitchen back splash. The smooth texture, combined with alternating transparent and colour tiles, adds dimension to a surface most of us take for granted. 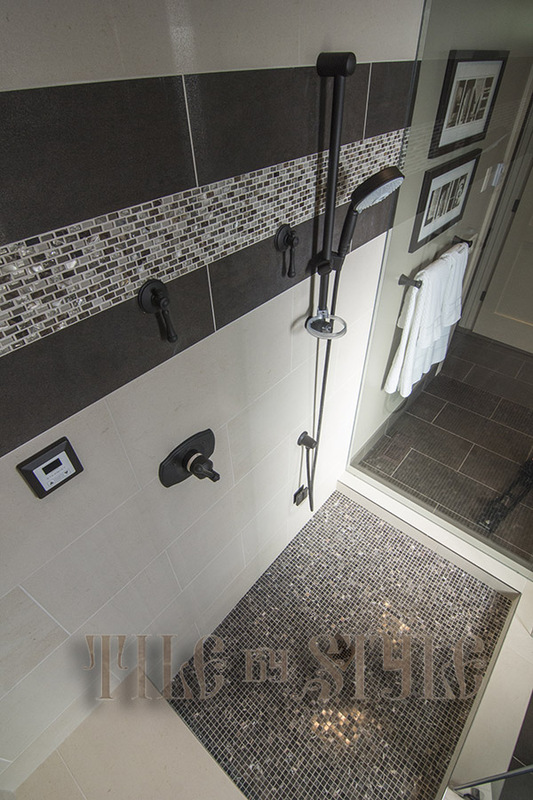 Similar glass tiles are featured in the shower enclosure of the master bedroom. The bathroom offers comforting tile design features, whether you are resting on the tiled bench inside the shower or relaxing in the tub beside the fireplace.